« A Gathering of Gainsboroughs. Some people my age don’t have them any more but I am not one of those. I don’t care how many years I have been here or about going backwards ( like some people do with their ages), I still like my birthday. Actually I am lucky and nearly every year have a birthday week or sometimes month with things strung out as far as I can push it! 🙂 This is because my friends and family are so far flung that it takes a while to get everyone in! I thought on my birthday I would introduce you to my favourite dummy board. If I had a lot of money and she was for sale…this is the very little girl I would own. Of all the dummy boards I have seen ( and that is now in excess of 500!) This is the one I would live with. 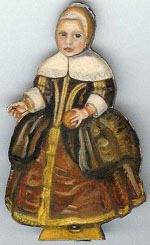 Girl with orange, c. 1630 Flemish, Wilberforce House, Yorkshire. She is nothing short of delightful. Alys is the best one in the collection, no doubt about it. BUT she isn’t actually kosher….”Aw…. that’s sad” I hear you cry! Yes it is. But it doesn’t make her any less lovely…or any less convincing. When I first saw this picture, I had no idea of how large she was. It’s hard to judge with the background and I had no details at first. SO, I assumed she was a full sized child of about four or five. She is in fact quite tiny and only about 3 feet high. Does this ring alarm bells? It should. 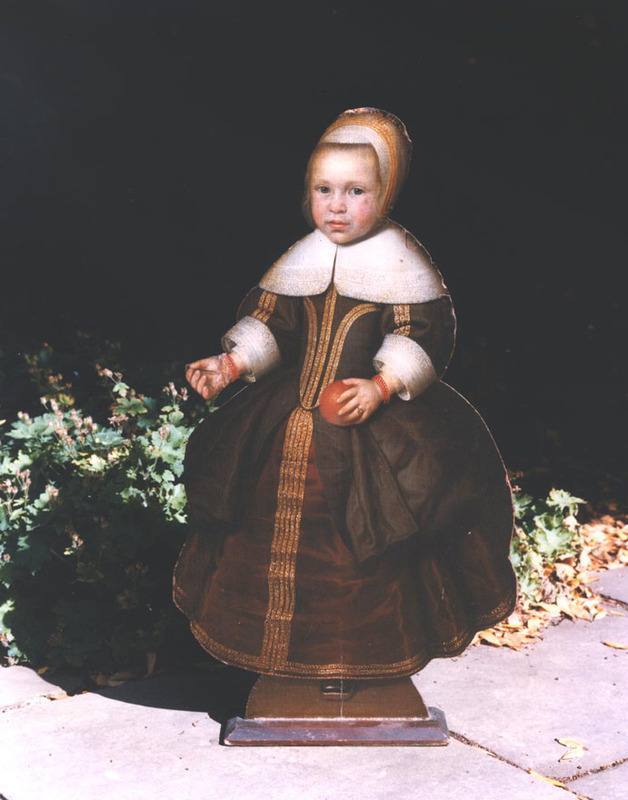 If she was a figure from the 17th century, and her costume tells us about 1630 Flemish, she would be life sized. No point in having a dummy board, at the beginning of the art form, when they were supposed to be visual jokes designed to make people jump and laugh, a bit on the wee side for reality. 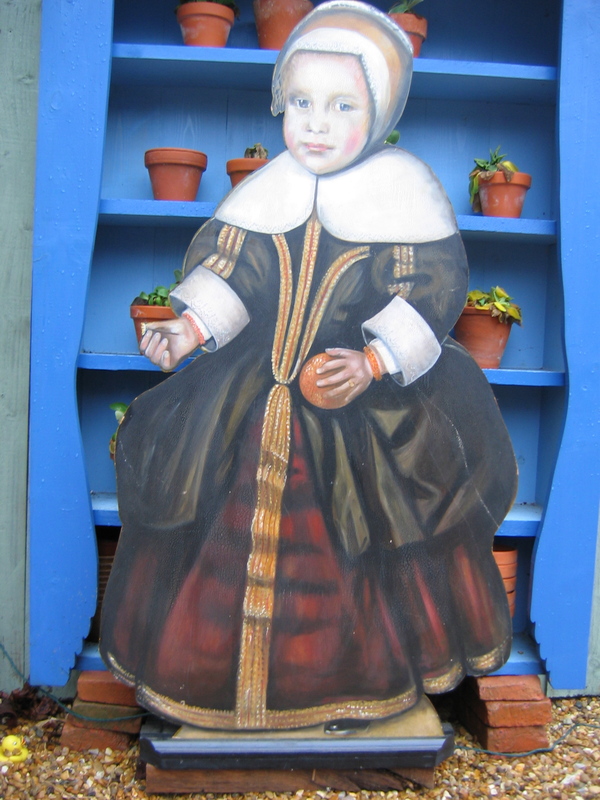 So, she can’t be what she is telling us she is…ie: a real 17th century dummy board. What she can be is a real 17th century portrait! There is no doubt that a girl like this lived somewhere in Belgium or Holland at the beginning of the 17th century and she was painted then, perhaps in with her brothers and sisters. Then at some time in the late 18th or the 19th century she was cut out of her canvas and mounted on wood to become a dummy board. Divided from her siblings perhaps….to stand alone. Never mind she makes a super dummy board and so sweet. She holds an orange, at this time, a rare and valuable fruit, in one hand and a small flower in the other. She wears an over skirt and bodice of brown silk over a stiffened frame, a stomacher of the same material and an under petticoat of tan silk upon which has been applied flattened woven gold guipuire ribbon. Her cuffs and collar are of the highest quality dense Flemish bobbin lace, the tiny patterned variety of which became fashionable in the early 17th century and she wears the coral bracelets that a young child wore in those days to protect them from evil. We can see one little black shoe peeping from under her dress and the curling blond tendrils which escape her close cap. She is from a wealthy family and is probably protestant. If you look at the post The Girl in the Red Dress, you will see what I mean about being Protestant. The other little girl is wearing a cross ( something definitely not allowed to Protestants) and her costume is much more colourful. Before I knew quite how small Alys really was I painted one for myself…life sized…and this dummy board lives with us in our dining room. Here she is taken standing outside the Auricula theatre in my garden. And of course I must paint a teeny tiny one mustn’t I? Alys..three inches. Now belongs to Sue and John Hodgson, those two experts of miniature furniture and painting fame. And guess what? I painted her, well finished her, on my birthday in January 2006. So she shares a birthday with me. She’s a lot older than me < ahem> you understand! This entry was posted on 26/01/2011 at 9:54 am and is filed under Uncategorized. You can follow any responses to this entry through the RSS 2.0 feed. You can leave a response, or trackback from your own site. I hope you have a lovely. Love the dummy board. I wonder how children were ever able to play properly in all those adult style clothes. Poor little things! Thanks Louise…am waiting for my friend who is going to take me out for a secret lunch….somewhere. I wonder how children ever did ANYTHING dressed as they were. This is just what we can SEE… then there’s what’s UNDERNEATH! Thanks Sandra…am doing very well so far. Thanks for the really cute card… Jack will have to double as a Fox terrier!